When we received a phone call from the Bennett family saying they’d like to bring in a check we were delighted. Every donation helps! And when they arrived, check in hand, we learned there was so much more to the story. Scott Bennett’s employer FlyteVu, which is based in Nashville, TN, gave their staff the ultimate gift: a way to make a difference. Each employee was tasked with two things: First, finding a nonprofit that was changing lives in their local community. And, then, delivering a large donation to support that nonprofit’s work. After learning more about the impact we’re having here in Central Indiana, and recognizing our need for philanthropic support to sustain our offerings, the Bennett family chose Children’s TherAplay. Scott, Jill, Leyton, and Jax arrived with big smiles … and a $10,000 check. Health insurance pays for a portion of each child’s physical or occupational therapy, but that still leaves a $78 per-treatment, per-child funding gap. Through their generosity, FlyteVu and the Bennett family funded six months of treatment for five different kiddos. Would you please join us in a round of applause? What makes it even better is the fact that 14 other nonprofits around the country received a similar donation. That’s right, FlyteVu contributed a total of $150,000. We’re honored to be in such outstanding company. 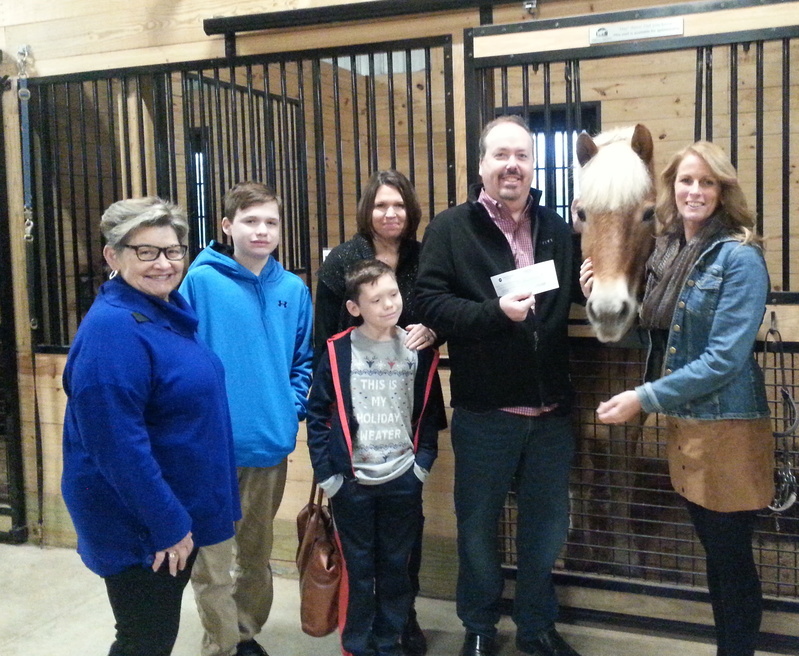 Thank you FlyteVu and Bennett family for having a heart for hippotherapy and kiddos who have special needs. If that $78 figure seems new, it’s because it is. Through continued operational efficiencies, we were able to decrease the per-treatment funding gap from $83 in 2017 to $79 in 2018. Multiply that $4 per-treatment savings by 750+ treatments a month and you’ll understand why we’re so excited. Every dollar helps! Also, do you see that smiling face to the right of therapy horse Moe? That’s our new executive director, Kathy Pelletier. We’re so pleased to welcome her to Children’s TherAplay. Learn more about Kathy here. Yes, that child is standing on horseback!